Find Bedding Sets, Bedspreads, Bed & Bath, and Kids Bedding. The Chezmoi Collection Seville comforter set’s dominant color is green. It has a brownish woodland green color. The comforter consists of two gorgeous patterns, medallion and paisley. MKXI Brand: MKXI is a registered trademark,please feel free to put the order,if you have any other questions,just contact us,we will reply within 24 hours.Our first goal is to provide you with the ultimate best customer service in the world and make you a lifetime happy customer, shop happy and confident with our 5-star satisfaction guarantee. 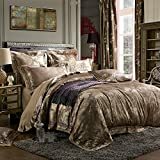 Measurements: Duvet Cover 3pc Set – Full/Queen Duvet Cover 90″ x 90″ , 2 Pillow Shams 26″x 20″King Duvet Cover 104″ x 90″ , 2 Pillow Shams 36″x 20″Duvet Cover is generous jacquard design with broad-brimmed. Material of product: Duvet Covers from MKXI aren’t just made from a wide range of different materials, they’re made from all kinds of style. 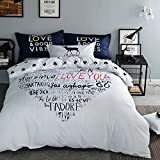 MKXI most popular duvet features well designed print patterns, you are sure to find a duvet cover to fit your style and taste. Care instruction: Machine wash cold, gentle cycle, only non chlorine bleach when needed, tumble dry Low, Cool iron if needed.